WhatsApp is one of the most popular telecommunication channels in the present day. Once this application came into the Play Store, it quickly replaced the Text option on all our phones. A one-to-one online messaging app, WhatsApp is very easy to use. The idea is that you can create your account with just your phone number so you do not have to remember one extra password. Once your account is linked with your contact information, you will be able to view the app and the different features that it offers. All the contacts on your phone will be accessible to WhatsApp. 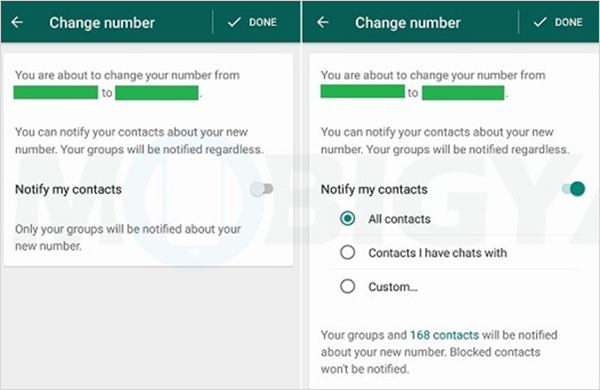 The contacts which are associated with the app will show up as a list when you open WhatsApp on your phone. You can click on any one of them so that the chat box opens and you can send a message. Tips: If your WhatsApp messages get lost or deleted by mistake, you can quickly recover them by using Gihosoft Free Android Data Recovery Software. It is easy to use and time-saving. Here is a full guide on how to recover deleted WhatsApp messages. One of the primary reasons why WhatsApp has gained so much popularity is that it allows easy transmission of media files like pictures, videos, and music between people. You will no longer have to attach files to your emails when you want to share a multimedia file with your loved ones. WhatsApp also allows you to call and video calls your contacts. What happens if you change WhatsApp number? It might happen that you find yourself in a position where you have to change the contact number that you have linked with WhatsApp. Nobody likes losing messages and important files which means that making a new account is not a feasible option. So what should you do? WhatsApp allows you to change your number on the app directly without any fuss. You can retain all your data and your chats because you will be keeping your old account itself. The Change Number feature is helpful when you are trying to use a new SIM on your old phone because your data storage will not be affected. On the other hand, if you are using a new phone and a new SIM, then you will have to change your number on the old device and backup all your data before you can finish the process on your new phone. WhatsApp’s objective is to verify the new number and ensure that there is no theft or misuse of data. You cannot change WhatsApp number without verification because your account will remain unauthenticated. You will not be able to receive or view messages. Your account information has migrated from your old number to your new number. All the profile information will be displayed accurately when you open WhatsApp using the new number. The feature also ensures that groups remain intact so there is no fuss. Even the settings reflect in your revamped account just as they had been before you made the change. When you change your number, you are also deleting the account that was linked to your old phone number. As a result, none of your contacts will be able to see that account on their WhatsApp list anymore. There will be no confusion, and you can make a smooth transition. The best part is that you will not lose your chat history in the process. Before you get started, there are some things that you should keep in mind. You have to ensure that your new phone number is active when you are trying to link it to WhatsApp. It should be able to receive texts and calls so that the app can verify the number. The Change Number feature cannot be used without an active data connection on your phone. WhatsApp will be able to verify your new number only if the old number if already verified. Before you make any changes, check the status of number verification on your app. Go to the Menu where you will find an option for Settings. Click on your profile picture to view your name and number. Your contacts will not receive individual messages when you change your number. Only groups are collectively notified about such a change. If you do not want your contacts to not recognize you when you message them, it is best to inform them beforehand. If they have your number saved, they can continue chatting with you without a break. 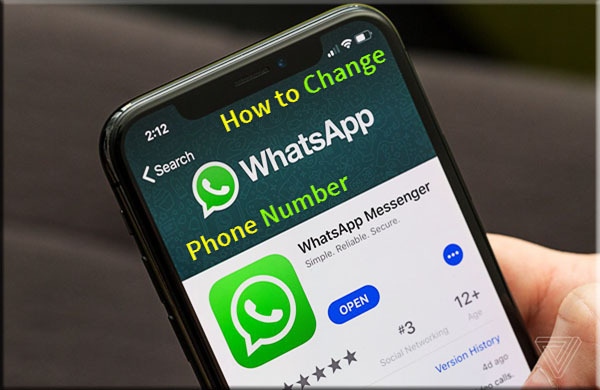 How to change WhatsApp phone number? 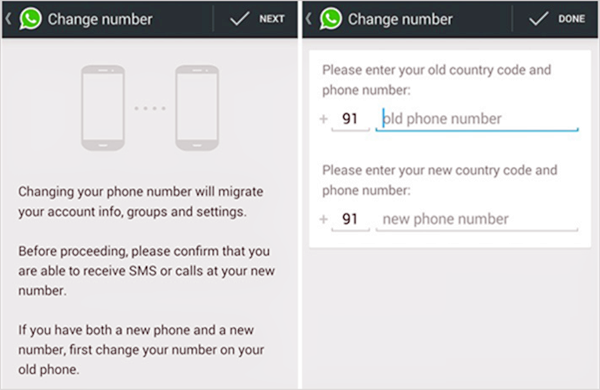 Are you wondering how to change the number in WhatsApp? It is a fairly easy process if you follow these steps. You have to begin by discarding the old SIM and inserting the new SIM card into your device. That will alert the phone about the new number so you can start with the changing process. Open the application, WhatsApp on your phone. If you failed to check the verification status of your old contact before, now is the chance to do so. Go the Settings from the Menu option and view your profile details. If your old number was verified, then it will appear along with your name when you tap on your profile picture. Now come back to the main Settings menu where you will find an option for Account. Click on Change number and a new window with two boxes will pop up. The top box will ask you for your old phone number while the bottom box will ask for your new number. Once you are sure that you have entered them correctly, click on Done. The app will now try to verify your new phone number by placing a call or sending an OTP. Insert your new SIM into your new phone. Take your old phone and open WhatsApp. Change the number as directed before. You will receive the verification details on your new phone. Provide them correctly. Back up all your WhatsApp data. Download the app on your new phone.